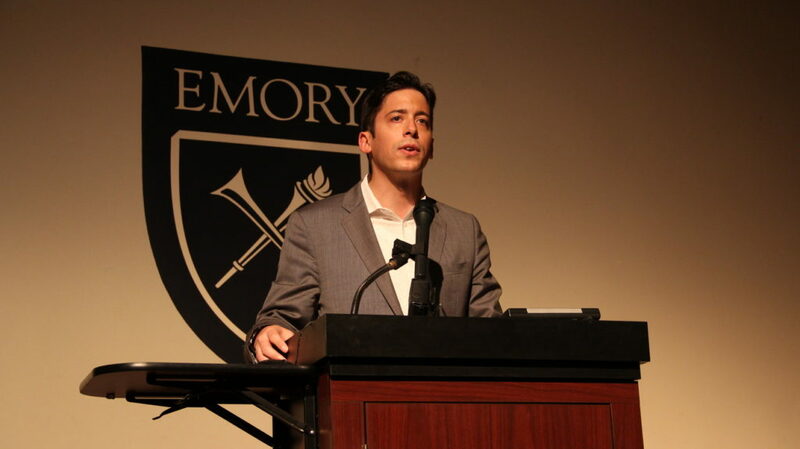 Conservative political commentator Michael Knowles took to the Harland Cinema stage on Feb. 11 to condemn liberal policies on climate change and diversity, in addition to arguing the pros of conservatism. About 75 people attended the event, which was hosted by Young Americans for Freedom (YAF) and student group Emory College Republicans. The speaker continued with jabs against former President Barack Obama’s legacy, liberal perspectives on sexual orientation and the Pride movement. Knowles argued that conservatives are “happier” than liberals because conservatives view politics as an art, while liberals take a more quantitative approach to policy. Liberals are hypocritical in espousing support for ideological diversity, Knowles said. “The left despises imperfection. If you contradict their narrow, homogenous view of perception they want to discard you — literally they will kill you for it,” Knowles said. Knowles criticized Emory’s response to a series of pro-President Donald J. Trump chalkings on-campus in 2016. He joked that the chalkings were a “vicious and awful hate crime,” implying that Emory’s reacted in an overly sensitive manner. Former University President James W. Wagner wrote that the chalkings represented “values regarding diversity and respect that clash with Emory’s own” in an email to Emory students in the aftermath of the chalkings. At the time, conservatives across the nation expressed sentiments similar to Knowles’. Jonathan Lauria (22C), who attended the event, said he enjoyed listening to Knowles although he did not agree with all of Knowles’ viewpoints. Christopher Borg, a freshman at Georgia State University’s Andrew Young School Policy Studies, echoed Lauria’s sentiments, saying he appreciated Knowles’ sense of humor.